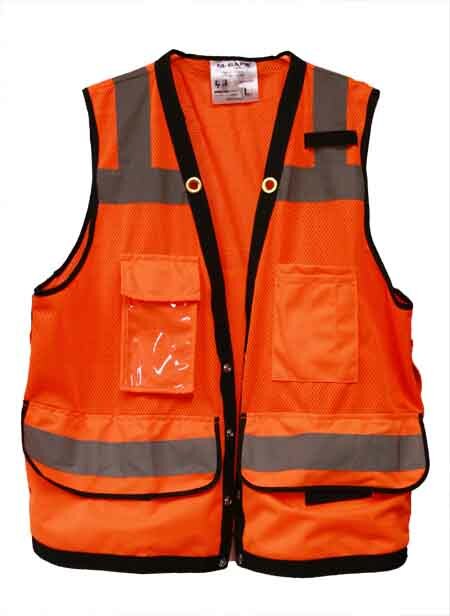 Good for light to medium duty for a variety of occupations and conditions. Heavy Duty, 100% polyester open weave mesh. Two gromets for instrumental lanyard. Two horizontal stripes and One vertical 2"-wide reflective stripes on front and back. Right chest pocket with flap and see-thru ID pocket. Large front utility pocket with large flap on Left and Right. Two inside pockets with velcro closure. Pass-thru pocket along back with snap closure.